Transatlantic Conversations is a project run by Maggi Olin (SE) and Christine Jensen (CA). 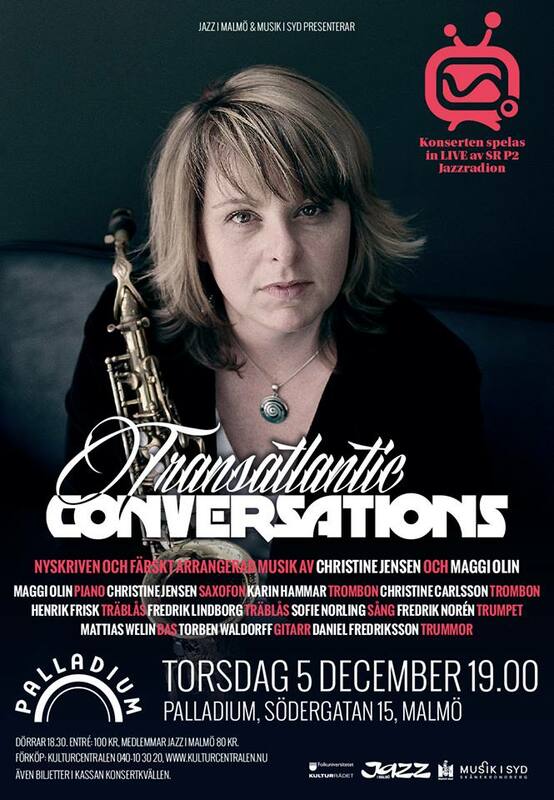 An ensemble consisting of Maggi Olin - piano, Christine Jensen - altsax /sopransax, Fredrik Lindborg - baritonsax, klarinett, tenorsax, Henrik Frisk - tenorsax/basklarinet, Fredrik Noren- trumpet, Karin Hammar och Christin Carlsson - trombon, Sofie Norlin - sång , Torben Waldorff - gitarr, Mattias Welin - bas, Daniel Fredriksson - trummor will perform music the two band leaders have composed for this project. Listen to the radio broadcast here!